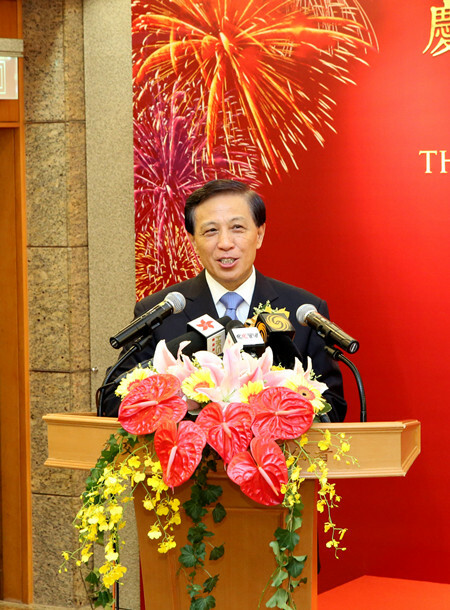 On 2 July 2017, Commissioner Xie Feng and his wife hosted a reception to commemorate the 20th anniversary of the establishment of the Commissioner's Office. 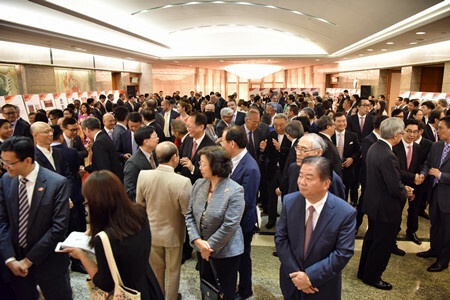 Over 400 people attended the event, including CPPCC Vice Chairpersons Tung Chee Hwa and C Y Leung, Chief Executive Carrie Lam Cheng Yuet-ngor, Executive Vice Foreign Minister Zhang Yesui, Director of the Central Government Liaison Office Zhang Xiaoming, Commander of the PLA Garrison Tan Benhong and Political Commissar Yue Shixin, Foreign Ministry Commissioner in Macao Ye Dabo, former Commissioners Ji Peiding and Yang Wenchang, former Vice Foreign Minister Qiao Zonghuai, former Chinese Chief Representative of the Sino-British Joint Liaison Group Wang Guisheng, Honorary Ambassador for Poverty Reduction Madam Le Aimei, Deputy Commissioners Tong Xiaoling, Hu Jianzhong and Song Ru'an, heads of consular missions, representatives of international organizations and Chinese-invested businesses, as well as representatives from all social sectors in Hong Kong. 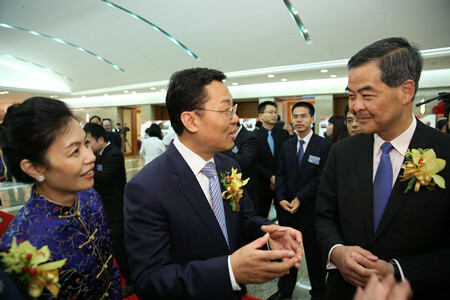 The reception was moderated by Commissioner Xie Feng. 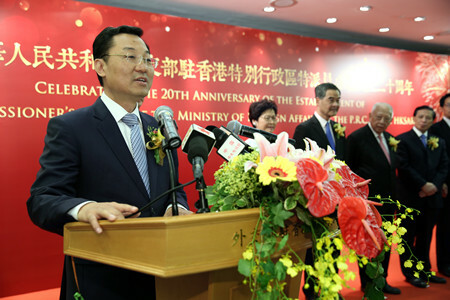 Executive Vice Foreign Minister Zhang and Chief Executive Carrie Lam delivered addresses. Executive Vice Minister Zhang expressed congratulations to the 20th anniversary of the Commissioner's Office. He said in his address that the "one country, two systems", "Hong Kong people administrating Hong Kong" and a high degree of autonomy has turned from a great vision to reality. Hong Kong has enjoyed stable economic growth, steady progress in the democratic political system in pursuance of law and new improvements in all social undertakings. These achievements have been widely recognized. Hong Kong's external exchanges and influence, as well as its international participation has continued to expand. Its position as an international financial, trading and shipping center has been consolidated. Hong Kong residents find it more convenient when travelling abroad and Hong Kong's appeal as an international metropolis keeps increasing. The number of consular missions in Hong Kong increased from 88 in 1997 to 121 today. HKSAR passport holders enjoy visa-free or visa-upon-arrival treatment in 158 countries as opposed to 44 previously. Hong Kong is member to 80 inter-governmental organizations, and has attended over 1,800 international events as member of the Chinese delegation and over 27,800 international meetings in the capacity of "Hong Kong, China". Hong Kong has entered into 133 bilateral agreements with foreign entities. Tens of thousands of Hong Kong compatriots have received consular protection and services from the Foreign Ministry and the diplomatic missions after encountering danger, difficulties or troubles abroad. What has happened in the past 20 years tells that Hong Kong will only be a better place when the motherland keeps growing. With sustained growth and rising international standing and influence, the motherland offers guarantee for Hong Kong's prosperity and development and creates bigger space and more opportunities of international cooperation for Hong Kong. Executive Vice Minister Zhang stressed that President Xi Jinping delivered important address at the Meeting Celebrating the 20th Anniversary of Hong Kong's return to the Motherland and the Inaugural Ceremony of the Fifth-Term HKSAR Government. We will follow his guidance and requirements, build on what has been achieved and keep up with the times to advance Hong Kong-related diplomacy. We will resolutely safeguard national sovereignty, security and development interests, oppose outside interference in Hong Kong affairs, steadfastly uphold the fundamental system of "one country, two systems" and stop any behaviors or activities that undermine national unity. We will actively facilitate and assist Hong Kong's engagement and cooperation with the rest of the world in business, financial, cultural, tourism and other fields, and continue to support Hong Kong in its participation in international organizations and conferences in appropriate capacities. We will assist the Hong Kong SAR in opening more economic and trade offices (ETOs) and entering into free trade agreements with relevant countries and regions, and help Hong Kong raise its international competitiveness and profile. We will support Hong Kong's active role in the Belt and Road Initiative, and bring into full play its advantages in geographical location, culture and professional services, and help the city seek more business opportunities and take part in cooperation projects. We will continue to uphold the conviction that "the safety and interests of Hong Kong compatriots are of paramount importance" and provide 24/7 consular protection and services to them, and encourage more countries and regions to give visa-free or visa-upon-arrival treatment to HKSAR passport holders. We will step up public diplomacy in the city so that more Hong Kong compatriots will have a deeper understanding of the country and its diplomacy and give more support to the diplomatic work. 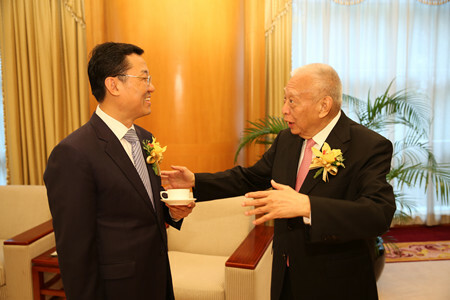 In conclusion, Vice Minister Zhang expressed hope that the Commissioner's Office will elevate the capacity and performance of Hong Kong-related diplomacy and make new contribution to the great cause of "one country, two systems" and enduring prosperity and stability of Hong Kong. 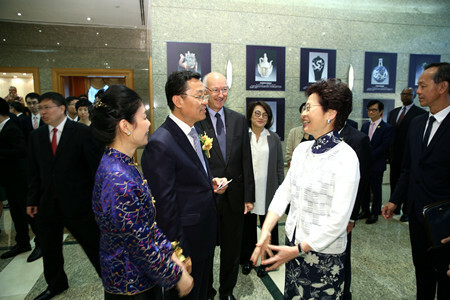 On behalf of the HKSAR and its Government, Chief Executive Carrie Lam Cheng Yuet-ngor thanked the Foreign Ministry and the Commissioner's Office in Hong Kong for the efforts made over the two decades to help expand the city's external exchanges, increase its international influence, and protect the lawful rights and interests of Hong Kong residents overseas. She said that since its establishment on 1 July 1997, the Commissioner's Office has been responsible for handling foreign affairs relating to the HKSAR in accordance with the Basic Law. 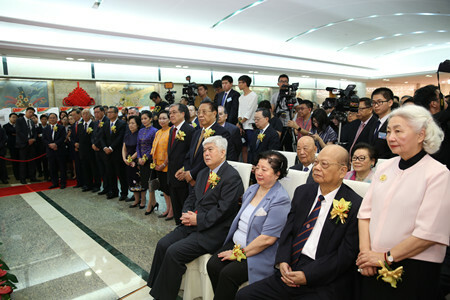 Over the two decades, thanks to the generous support of the Foreign Ministry and the Commissioner's Office, the HKSAR has actively engaged in external changes, HKSAR has elevated its position on the international stage through participating in international organizations, hosting international conferences and entering into agreements with foreign entities. This has demonstrated the success of "one country, two systems". 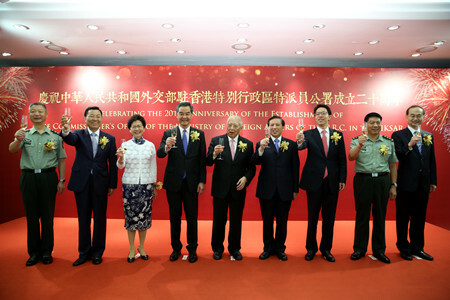 Chief Executive Carries Lam further noted that the HKSAR Government joined over 200 international organizations in the capacity of "Hong Kong, China" where statehood is not required, and pariticpated in over 30 international organizations requiring statehood as member of the Chinese delegation or in the capacity approved by the Central Government or the relevant organization. Over 1000 international events were hosted or co-hosted in Hong Kong since 1997. 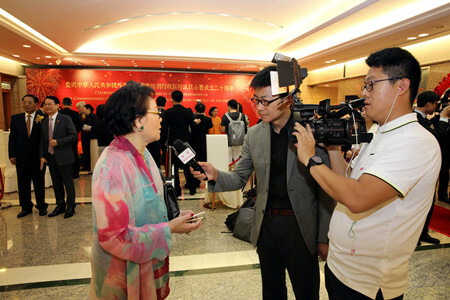 Carrie Lam noted that the HKSAR Government entered into over 170 bilateral agreements with foreign governments and signed over 400 agreements with foreign entities and international organizations. These figures are a demonstration of the close cooperation between the HKSAR Government and the Commissioner's Office and the important role of the "one country, two systems" in the cooperative process. 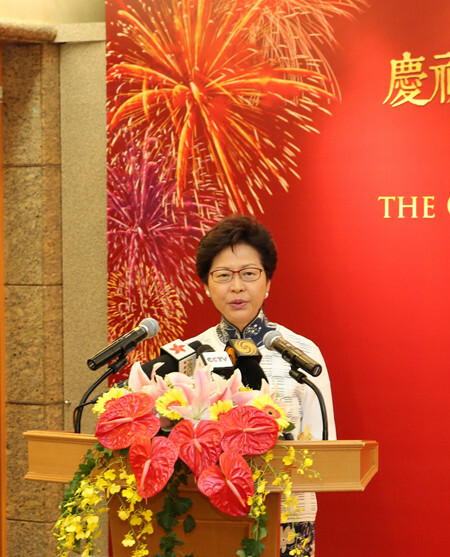 Carrie Lam thanked the Foreign Ministry and the Commission's Office for supporting and helping the HKSAR Government set up new ETOs. The Government is preparing to set up more ETOS and to further improve connections among ETOs. Carrie Lam said that the Foreign Ministry, the Commissioner's Office and the overseas diplomatic missions have worked in an all-out manner to provide consular protection for the Hong Kong residents. The diplomatic missions have provided emergency services to Hong Kong residents whenever they asked for help. Over the past year, more than 800 consular cases involving Hong Kong people were handled, with considerate consular protection and services provided to Hong Kong residents overseas. I believe that the Hong Kong residents know it by their hearts and are grateful to the Foreign Ministry and the Commissioner's Office. Carrie Lam finally concluded that over the two decades, thanks to the strong support of the Foreign Ministry and the Commission's Office, the HKSAR has truly enjoyed the institutional strengths of both the "one country" and the "two systems" as described by President Xi Jinping yesterday. The city has continued to expand its external engagement, hosted and taken active part in international conferences and activities and improved its status on international stage. What has happened shows to the international community the full and successful implementation of "one country, two systems". In future, the HKSAR hopes to continue working with the Commissioner's Office, and jointly play an even bigger role to consolidate Hong Kong's leading position in the world and promote its prosperity and stability. Commissioner Xie Feng thanked Executive Vice Minister Zhang for the encouragement, and thanked Chief Executive Carrie Lam, successive SAR Governments and friends from all sectors of the SAR for their consistent support to the work of the Commissioner's Office. He noted that he and all his colleagues at the Commissioner's Office will faithfully implement the instructions of President Xi Jinping, and live up to the expectations of the CPC Central Committee and the Foreign Ministry. We will keep abreast of the times and redouble efforts to firmly uphold the state sovereignty, security and development interests, actively promote the HKSAR's external cooperation and exchanges, and earnestly safeguard the lawful rights and interests of Hong Kong compatriots overseas. The reception was conducted in a warm and friendly atmosphere. The guests highly acclaimed the achievements made under "one country, two systems" and the outcomes of the diplomatic work relating to Hong Kong. They thanked the Foreign Ministry and the Commission's Office for supporting the growth of Hong Kong with the diplomatic strengths. The guests warmly welcomed Commissioner Xie Feng and his wife as they assumed office, and expressed willingness to strengthen cooperation with the Commissioner's Office to jointly build Hong Kong's even brighter future.